I’m just back from a project in Tonga, studying the whale tourism industry. The thing about ‘swimming with whales’ is you’re not simply swimming in the same ocean as the whales, you’re swimming with the whales. It’s very clearly a two-way interaction. The Tongan government rightly regulates the industry to manage the impact of tourism on the whales (much as Australian governments do): swimmers may not approach within 5m of a whale. But there are no such restrictions on the whales’ behaviour. Thirty five tonne, 17m long whales commonly approach and even gently nudge swimmers. When a mother brings her 3 month old calf back, time and again to have a better look at you, there’s something going on. It’s all too easy to anthropomorphise and talk of making a ‘connection’(after all, we share >98% of their DNA). Are they simply curious? Are they consciously taking care not to injure you (it would certainly seem so)? Are they seeking to make a ‘connection’ with these pathetically flapping drop-ins (us)? We’re just so far from any real understanding. The popularity of swimming with whales continues to grow, with around 150 people / day in the water with the whales that visit Vava’u over the winter and spring months (although these interactions are spread over a substantial area of ocean and the duration of many encounters is brief). The regulations, weather and of course the whales themselves ensure that encounters are carefully managed, and injuries to swimmers are apparently very rare. But where is this all heading? 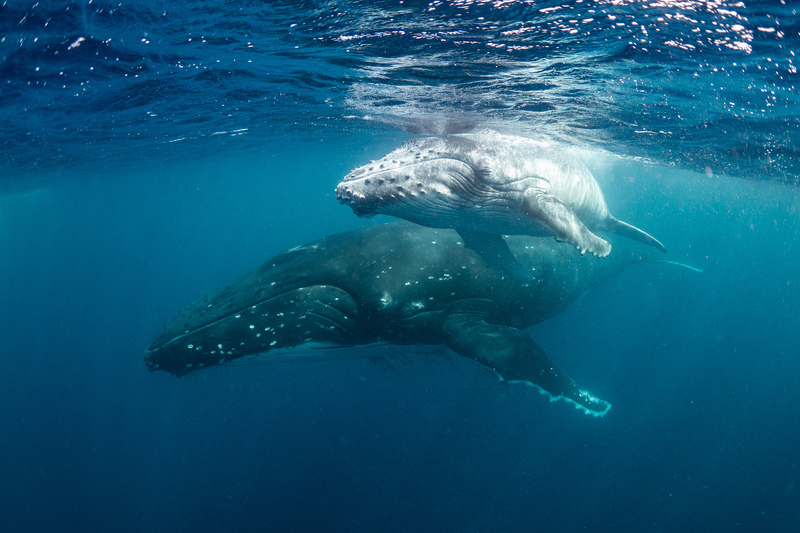 Is ‘swimming with whales’ simply another adventure tourism bucket-lister? For my money, the whales are far more powerful advocates for conservation of the oceans than any cute clownfish. In an environment where the whale is clearly in control and often ‘makes the first move’, there is enormous potential to benefit both species and the environment we share. We can’t afford to ignore it. Swimming with whales is a privilege that most are willing to pay for. If only a small percentage of the dollars spent is channelled into management that ensure the whales’ wellbeing and research aimed at better understanding the whales’ interest in us, the positive influence on environmental management is likely to be substantial.